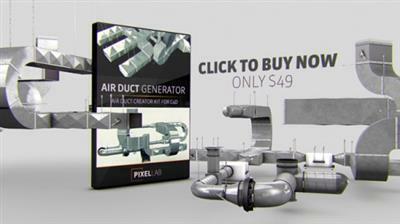 Announcing the brand new Air Duct Generator for Cinema4D! Create custom air duct features and elements in a few clicks or use one of the 85+ objects or preset rigs! This rig, created by my friend Peter Holweg (xplicitcreations.com), is incredibly easy and fun to use. Simply pick from 85+ component options, click one, and it will instantly create custom air ducts. We have also included a .lib4d with each element so you can access them if you don't have the Character Object which requires the full Studio version. Also included are 15 free full presets that you can quickly add to your scene!